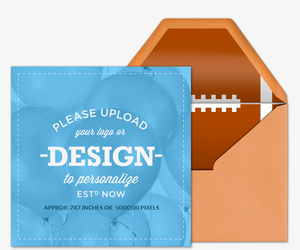 Gear up for game day with free and premium digital invitations from Evite. 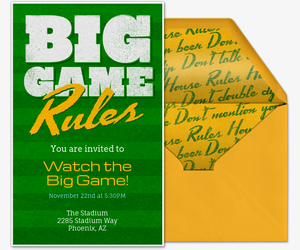 Choose from dozens of themed designs to rally fellow fans for the game - whether you’re heading to the stadium or watching from your big screen. 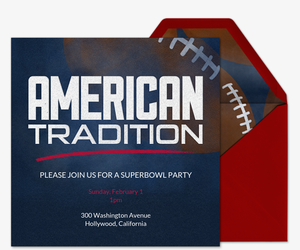 Bring on your A-game with paperless invitations. Provide a custom host message and your event details, track RSVPs as they come in, manage the guest list, post comments, share photos, and more -- all in one place. Hosting doesn’t need to be stressful; get guests to contribute food and drinks with the “What to Bring” tool, or add a co-host to your invitation to split the planning workload. Plus, plan anytime, anywhere with the Evite mobile app for Android and iOS. 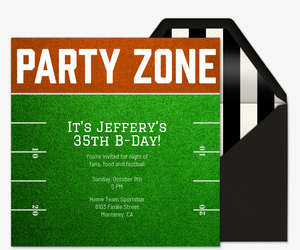 Impress your guests with Evite Premium, an ad-free experience with the same look and feel as traditional paper invites. 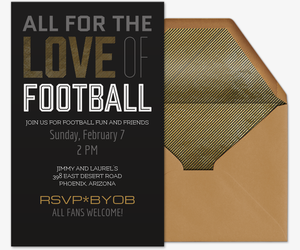 Premium invitations include matching digital envelopes, custom stamps, and add-ons such as photo and text cards. Pricing depends on the number of guests you invite. 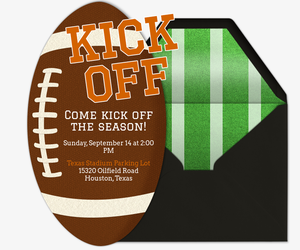 Touchdown with winning game day tips and video content from Evite Party Ideas. Even if you’re a rookie, you can follow simple steps for game day spreads, DIYs, decoration ideas, games, free printables, and more. 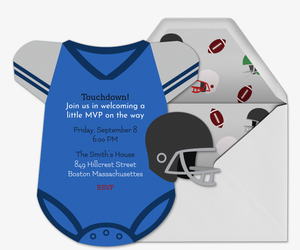 Searching for another sports-themed invitation, or just planning the pre-game? 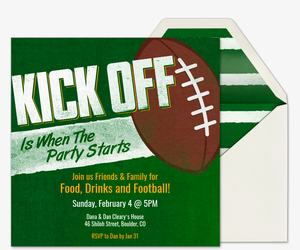 Browse our tailgating invitations, big game invitations, soccer invitations, basketball invitations, and more.